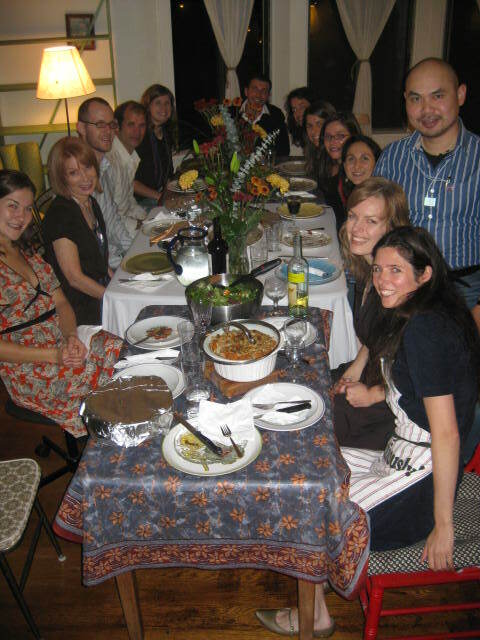 The American holiday Thanksgiving is approaching, and with it, millions of families (and urban tribes like mine, pictured above) will gather to gobble down turkey and sweet potatoes with marshmallows baked on top. Many of them will also go around the table to share what they are grateful for in their lives. This ritual has always been my favorite part of Thanksgiving. In a consumer-driven society where we are so often complaining about what’s not quite right with our lives, it feels great to hear people acknowledge their personal abundance. This year, I have been thinking that I am grateful for still being single, which, honestly is not what I would have said last year. I took this year off to travel and I did the journey alone. I’ve grown in many ways that would not have been possible had I found a lifelong partner before I bought the ticket and made the final decision to go. I’m sure I would be grateful for that person, had we met. But I am also very grateful that I took full advantage of being single this year instead of hanging around San Francisco with the agenda of finding a mate (which honestly, was getting kind of boring–more on that in another post). First and foremost, you are alive. Single. Just as you came out of the womb. Being single is the starting point for life, and we will in a sense be single when we pass on. So be grateful for your singular existence now, that you are alive! The time to discover what makes you happy A relationship can be very time-consuming. When you are single, you have all your free time outside of work and other obligations to discover what brings you joy. Use it and be grateful for it! Being single gives you the opportunity to create more joy in your life without depending on someone else to provide it for you. You haven’t settled! No relationship or person will be perfect. But many people are afraid of being single and stay in relationships that are not working in order to avoid the pain of breaking up or being alone. Every person is a little bit wrong, being single means you are free to go out and find someone who is wrong for you in all the right ways. Count your blessings my (single) quirkyalone friends. Share your reasons for being grateful that you are single at this stage of your life in the comments. Hmm… I have to admit that I’m happy to be single again! Greetings from Belgium to all the thanksgivingers, W.
Love this posting Sasha. This is the first year, I’ve actually gone from accepting being single to cherishing it, and has been an incredible year. I haven’t traveled liek you, but did buy a condo and started a small side buisness. I spent the whole summer with my family and friends. One of my greatest joys of being single (and not having children) is that I get to be the Auntie to my friends’ children, my little cousin and my new nephew. Being able to be an Auntie that can adore them and give them all my attention is one of the greatest gifts I can think of. I am thankful to be able to sign on to this Quirkyalone site and meet some of my family. I LOVE being a quirkyalone and just want to Shout it out! Thanks for the nice article…You got to enjoy your life…quirkysingle or quirkcouple. I am blessed to be single now. Good for you! The stats show that many are discovering what you and I already know: being single can be really good! This is such a nice affirming blog. Thank you for writing it and reminding me about all the wonderful things about living alone. My best friend passed this on to me and I salute you for writing such a lovely positive post to remind us of our blessings. Happy Single New Year. Traveling alone is wonderful, self-educating and something to savor in my old age. I’m thankful that my last relationship ended 10 months ago, and that we’re still the best friends. I really like myself and him better now that we’re not together anymore and I am so NOT done with being single I’m figuring out who I was before that relationship and who I’ve come to be. And it really is a great luxury to have all my time for myself. By the way: I’m so thankful that you wrote ‘Quirkyalone’ and that it found it’s way to Denmark and into my hands. Thank you so much for Quirkyalone and the work that you do. I am a 43 year old single man in London. Apart from one long term relationship of 5 years, I have been single almost all of my adult life and, the older I get, have come to realise that singledom seems to be my natural state of being. Freedom seems to be fundamental to me and allows me to pursue strong creative interests, voluntary work as well as the development of friendships. However, I have often worried and fretted over my seemingly permanent state of singledom and feel that the social norms and pressures of coupledom have often led me to feel that there must be something wrong with me and to feel a sense of fear and foreboding about the future. I find your work to be a great comfort – not only in reminding me of the growing social trends and ‘norm’ of singledom – but also articulating many of the advantages of singledom and smoothing many of the fears that I have had about being single. Quirkyalone has been incredibly valuable in helping me on my journey towards feeling deeply centred and comfortable with myself and who I am and helping me towards my goal of ‘just living’, being present and trying to live as enriched and fulfilling a life as I can. All the very best to all Quirkyalones. I agree- there is so much pressure to be in a couple, both from outside and within ourselves. It’s like the fear of being alone is hardwired into us, because obviously in the past our survival as individuals and as a species depended on not being alone. For singles, the pressure can be unbearable and can push them into bad and even dangerous relationships, but I’ve persevered and now relish being single and can’t see myself ever coupled up again. I am discovering who I really am and at last feel I’m living an authentic life. Mai, that idea is cool, but it is a 2 minute solution. You can not always eat in the same restaurant. After all, eating out is only one example. What about going to move theater? I can ask my friends to join me sometimes to accompany me, but I can not do it often. My issue personally is that I am a social person who is living a very unorthodox life of being single for quite a long time. If I were a kind of aloof person perhaps I couldn’t care less. But it hurts when my personality struggles with the life that I am living. Having experienced the alone time in-between relationships (breakups, divorce, widowhood); I am finally happy to be the me that does not have to live up to any one else’s expectations out of fear of rejection and/or abandonment. I am free to love myself and my life as a single person in a community of married people. I am free to explore honest, open, friendly friendships and relationships without the inevitable hassle of cohabitation. I am free to make all my own decisions. I am happy to be me, a single woman!